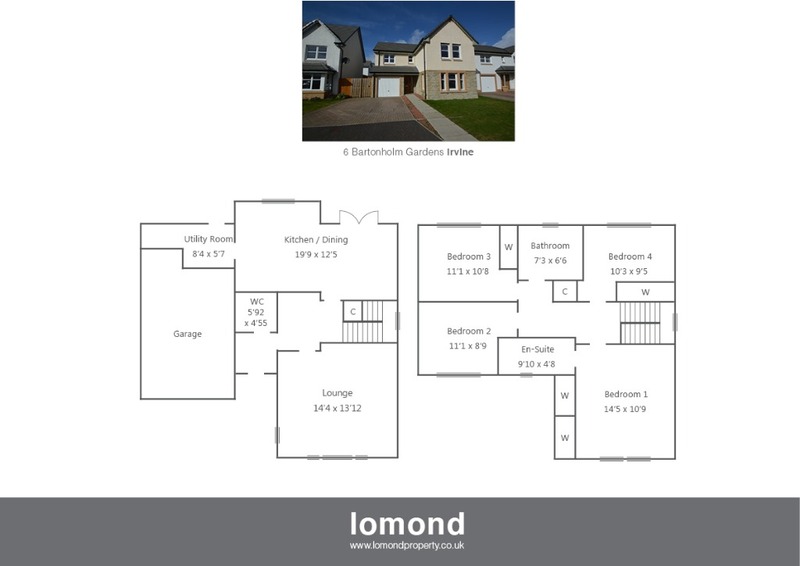 6 Bartonholm Gardens is a modern detached 4 bedroom house, situated in the highly sought after Fairways View Development on the edge of Irvine, the Lewis house style provides an excellent layout for modern living, complete with off street parking and garage. The property has been finished to an exceptionally high standard throughout and comes with contemporary kitchen and bathroom fittings. In summary the lower level layout extends to reception hallway with access to the cloakroom / WC. The lounge is front facing. The open plan dining / kitchen area overlooks the rear garden, French doors providing access, the kitchen is complete with integrated oven, hob, extractor, fridge / freezer and dishwasher. The utility room is located just off the kitchen and provides further access to the rear garden. The upper level houses four spacious bedrooms, three of which come with fitted wardrobe space. The master bedroom has access to its own en-suite shower room, the family bathroom is a fantastic space with bath, WC, WHB. Both bathroom areas have been well finished and include built in vanity surround storage units. Externally the property has off street parking leading to the garage at the front, to the rear is a sizeable garden. The current owners had been due to upgrade the rear garden and this has left it in an unfinished condition, the owners are open to discussions with potential buyers as to how this should be finished prior to completion. Bartonholm Gardens is a pleasant residential area, part of the Fairways View Development on the edge of Irvine. The town centre is close by and provides access to a range of amenities including supermarkets, bars, restaurants and town centre shopping. There are a number of local primary and secondary schools within the greater Irvine area. From bank street, turn right onto East Road, at mini roundabout take 3rd exit onto Burns Street, continue through traffic lights onto Kilwinning Road, continue along before turning left onto Sandy Road at the traffic lights, follow the road round and the site will be found on your left.